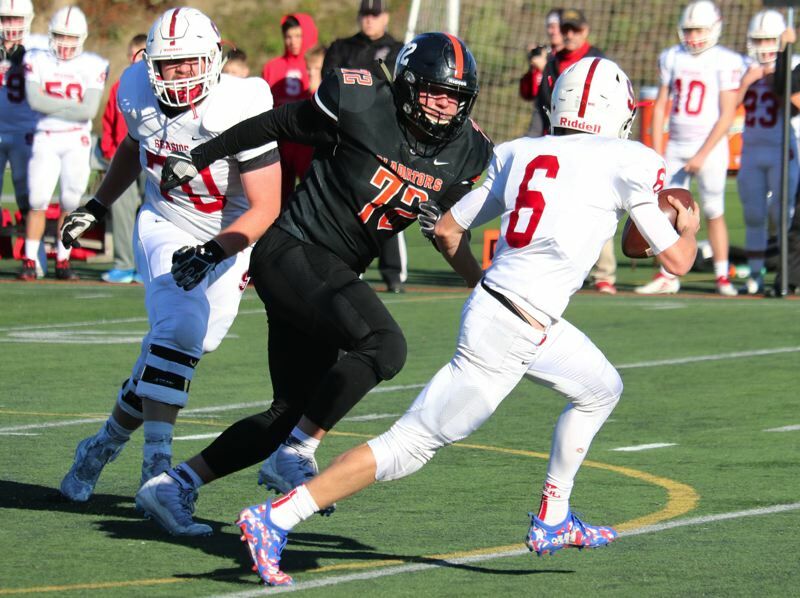 Gladstone senior lineman Jackson Simmons was named the Tri-Valley League's Defensive Player of the Year for the second time in three seasons, and teammate Jack Foss was recognized as the Co-Lineman of the Year after the Gladiators clinched their fourth league title in six seasons. "It's a great honor, but it's a team honor honestly," said Simmons, the 6-4, 270-pound tackle, who along with Foss was named to the all-league first team on both offense and defense. "I couldn't have done it without any of my teammates." Other Gladstone players to earn first-team honors were sophomore placekicker Mateo Burgos, senior wide receiver/linebacker Ben Hill, junior defensive back Jaxon Jedrykowski, junior tight end J.P. Peterson, and junior running back/kick returner Mason Scheehean. Senior running back Spencer Boyd and sophomore linebacker Sabastian Peiffer were named to the all-league second team for Gladstone, while punter Austin Conner, quarterback Jake Gehrke, linebacker Kahleb Newberry, and defensive lineman Stefan Smith earned honorable mention. "Honestly, I think all my guys should have been first-team, all-league players, just like the other coaches think the same thing, too," Gladstone coach Wayne Harris said. "I was happy with what we ended up with, but I truly believe that some of our players that were second team and honorable mention should have made first team." Quarterback: R.J. Veliz, Sr., Woodburn; Running backs: Sam Garcia, Sr., North Marion; Spencer Boyd, Sr., Gladstone; Logan Stamm, Sr., Estacada. Wide receiver: David Stamm, Sr., Estacada. Guards: Ryan Sandidge, Sr., Estacada; Erick Gonzalez, Sr., Crook County. Tackles: Caleb Parrott, Sr., Crook County; Daniel Hunt, Jr., Estacada. Defensive line: Ryan Sandidge, Sr., Estacada; E.J. Allen, Sr., Crook County; J.R. Soctt, Sr., The Dalles; Chazz Fobert, Sr., North Marion. Linebackers: Yordi Sanchez, Sr., The Dalles; Sam Garrison, Jr., Estacada; Jason Slawter, Sr., Crook County; Sabastian Peiffer, Soph., Gladstone. Defensive backs: Kaden Settle, Jr., Estacada; Brady Hansen, Jr., North Marion; Ben Nelson, Jr., The Dalles. Specialists: R.J. Veliz, Sr., Woodburn; Dominic Langley, Sr., Crook County. Quarterbacks: Gabe Helseth, Jr., The Dalles; Brody Connell, Jr., Crook County; Jake Gehrke, Sr., Gladstone. Running backs: Sabastian Peiffer, Soph., Gladstone; J.R. Scott, Sr., The Dalles; Kyle Knudtson, Jr., Crook County. Tight ends: Brady Hansen, Jr., North Marion; Steven Preston, Jr., The Dalles. Wide receiver: Austin Greene, Sr., The Dalles. Guards: Hunter Gotchall, Sr., Estacada; Jake Hesse, Sr., Woodburn; Emilo Guizar, Sr., Woodburn; Joe Ledesma, Jr., North Marion. Defensive line: Hunter Gotchall, Sr., Estacada; Emilio Guizar, Sr., Woodburn; Stefan Smith, Jr., Gladstone; Opath Silopath, Jr., The Dalles. Linebackers: E.J. Barajas, Sr., Woodburn; Kalehb Newbery, Sr., Gladstone; Steven Preston, Jr., The Dalles; Clayton Berman, Jr., Crook County; Sam Garcia, Sr., North Marion; Jonathan Sorrano, Sr., Woodburn; Asher Bufton-Gilford, Sr., Estacada. Punters: Johnny Page, Jr., North Marion; Austin Conner, Sr., Gladstone.